The Girl Without Hands is NOT a story for young children! It's one of the Grimm Brothers scariest stories (and that's saying something), featured in our Fairy Tales Guide recommended for ages 13 to adult. A certain miller had little by little fallen into poverty, and had nothing left but his mill and a large apple-tree behind it. Once when he had gone into the forest to fetch wood, an old man stepped up to him whom he had never seen before, and said, "Why dost thou plague thyself with cutting wood, I will make thee rich, if thou wilt promise me what is standing behind thy mill?" "What can that be but my apple-tree?" thought the miller, and said, "Yes," and gave a written promise to the stranger. He, however, laughed mockingly and said, "When three years have passed, I will come and carry away what belongs to me," and then he went. When the miller got home, his wife came to meet him and said, "Tell me, miller, from whence comes this sudden wealth into our house? All at once every box and chest was filled; no one brought it in, and I know not how it happened." He answered, "It comes from a stranger who met me in the forest, and promised me great treasure. 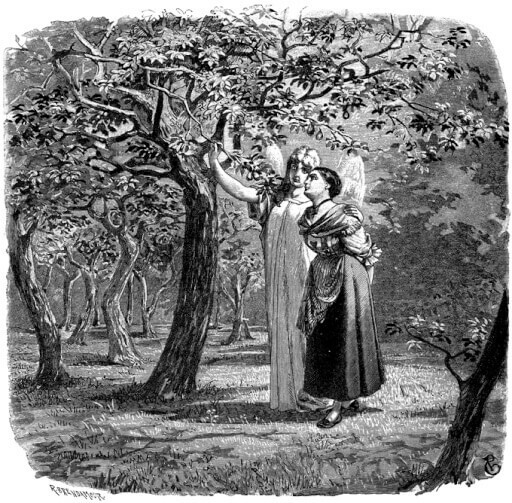 I, in return, have promised him what stands behind the mill; we can very well give him the big apple-tree for it." "Ah, husband," said the terrified wife, "that must have been the devil! He did not mean the apple-tree, but our daughter, who was standing behind the mill sweeping the yard." But the old mother wept to think such innocent blood was to be shed, and had a hind brought by night and cut out her tongue and eyes, and kept them. Then said she to the Queen, "I cannot have thee killed as the King commands, but here thou mayst stay no longer. Go forth into the wide world with thy child, and never come here again." The poor woman tied her child on her back, and went away with eyes full of tears. She came into a great wild forest, and then she fell on her knees and prayed to God, and the angel of the Lord appeared to her and led her to a little house on which was a sign with the words, "Here all dwell free." A snow-white maiden came out of the little house and said, "Welcome, Lady Queen," and conducted her inside. Then they unbound the little boy from her back, and held him to her breast that he might feed, and laid him in a beautifully-made little bed. Then said the poor woman, "From whence knowest thou that I was a queen?" The white maiden answered, "I am an angel sent by God, to watch over thee and thy child." The Queen stayed seven years in the little house, and was well cared for, and by God's grace, because of her piety, her hands which had been cut off, grew once more. Interested in other fairy tales for grown-ups? Visit our Fairy Tales Guide for recommended stories. Add The Girl Without Hands to your own personal library.